This month we’re featuring the release of 4 Banjo Songs, 1891-1897 by Charles A. Ashbury, likely the earliest extant banjo recordings by an African American artist. We’re also reviewing Music for Film by composer Terence Blanchard, known for his collaborations with director Spike Lee including the forthcoming film BlacKkKlansman. 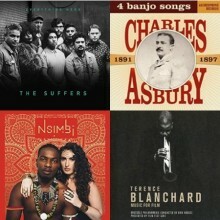 New releases include projects from two Gulf Coast soul/funk bands—Say Yeah!! 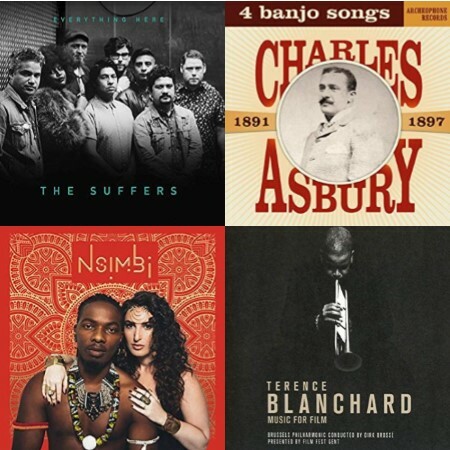 Live at the Blue Nile from the New Orleans-based Waterseed and Everything Here by Houston’s The Suffers—plus the self-titled debut from the American-Ugandan rap duo Nsimbi, the R&B/House music fusion of Oregon’s Chanti Darling on RNB Vol. 1, and Chicago harmonica player Russ Green’s debut album City Soul. Other reissue projects include Winston Jarrett and The Righteous Flames’ reggae classic Jonestown, legendary pianist Erroll Garner’s Nightconcert and the compilation of 20th Century Singles (1973- 1979) by Barry White’s Love Unlimited Orchestra. Wrapping up this issue is our list of July 2018 Black Music Releases of Note.